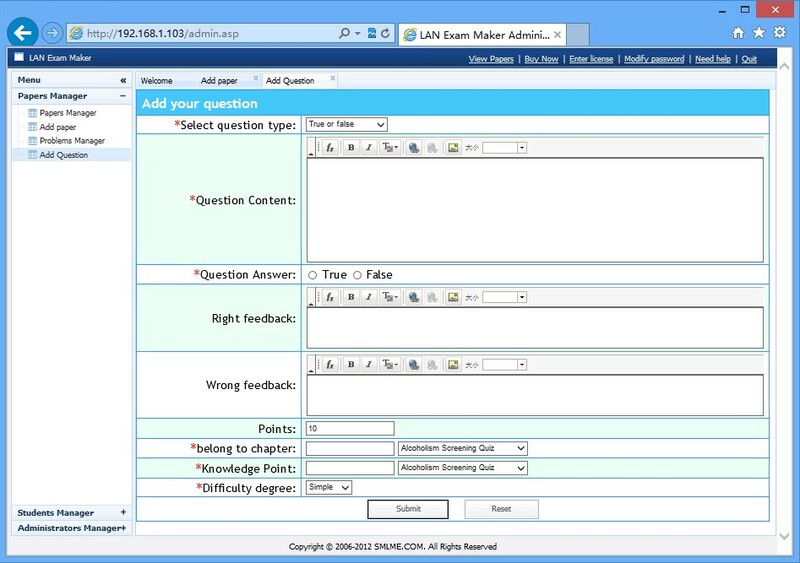 LAN Exam Maker is a web-based tool that allows you to build, embed and manage your own exams, tests or quizzes (or drill and practice) quickly and easily. LAN Exam Maker also can setting up their final exam to small businesses training employees.&nbsp;Using this software, you can write your problems, papers at home or anywhere else， and on your own computer in which you can protect you problems, papers from others. After write your papers,&nbsp;LAN&nbsp;Exam Maker make it possible that your students can do the test on your class only request that the students should have a computer, iPad, or even a smart phone, it is truly&nbsp;convenient. Not only the system brings much more&nbsp;continent&nbsp;to you, but also have many great features help you do the work better, and solve your problem.&nbsp;LAN Exam Maker is a powerful question management system that enables trainers and educators to make e-learning exams quickly and easily. With this tool, you can quickly create your assessments, publish them, test your students and even get the statistic&nbsp;information. It is designed for that. It can easily create problems, papers, manager the statistic information. With this product, you can make your test everywhere, you just need to install it on your computer. The software make your computer as the server which provides the services for your students to do the test, it means that all your students can connect to your computer to do the test. The data of the test would store on your computer which could not&nbsp;available&nbsp;for others, this beneficial to protect your data security and the fruits of labor. Planetsofts.com didn't scan LAN Exam Maker for viruses adware, spyware, or other badware. For safety reasons, we recommend that you always keep an updated antivirus installed on your pc when downloading and installing software from the web.